Hearthstone games have gone faster and faster over the past several expansions, but Knights of the Frozen Throne is looking to swing the pendulum back towards control decks. Hearthstone is journeying to the Frozen North for its next expansion. 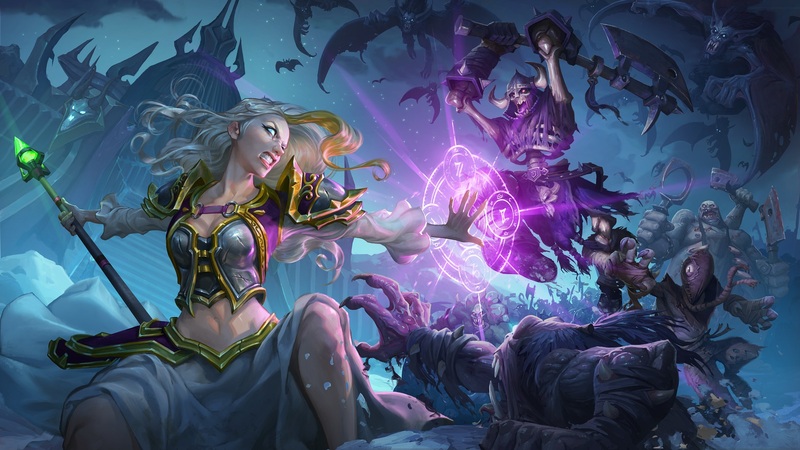 Knights of the Frozen Throne takes Blizzard's card game into Northrend for the first time, introducing some new mechanics and some new looks for the game's nine heroes. It also represents a chance for Blizzard to address certain trends within the game. With the introduction of the last several expansions, Hearthstone players have noticed that the pace of the average session has gotten faster. While there are cool high-cost minions and legendaries that have been brought into the fold, they quickly became unviable due to the rise of aggressive decks. Pirate Warriors, Druid and Shaman zoos, and Quest Rogues often had Hearthstone games ending somewhere in the neighborhood of five turns. It's not a problem that can simply be "nerfed" as a whole, because it would penalize players for simply playing the game. Blizzard now appears to have found a solution, with the reveal of Knights of the Frozen Throne. More specifically, through the expansion's new Lifesteal mechanic. "You may have seen some things like Lifesteal before," said production director Jason Chayes during Thursday night's reveal. "The way Lifesteal works is that anytime a minion does damage with Lifesteal damage on it, you heal that damage back to you as the healer." Chayes is referring to select spells and minions that have the Lifesteal effect. Veteran Hearthstone players may recognize these cards as ones similar to the Priest's Holy Nova or the Warlock's Mistress of Pain. So calling Lifesteal a "new mechanic" may be something of a misnomer, but emphasizing it for the new expansion is certainly a new idea and one that will only help the game going forward. The idea, according to game director Ben Brode, is to give a boost to the control style of play. It certainly does that, because unlike some of the tools from the previous expansions, this isn't just a piecemeal fix. This isn't Golakka Crawler, which deals with a circumstantial pirate play. It isn't Gluttonous Ooze, which only deals with weapons. It's not Devolve, which targets Deathrattle or an Edwin VanCleef. Lifesteal is a gamewide mechanic that brings aggressive play down several notches. Lifesteal minions encourage trading into enemy minions, while staving off the threat of a dwindling health count. 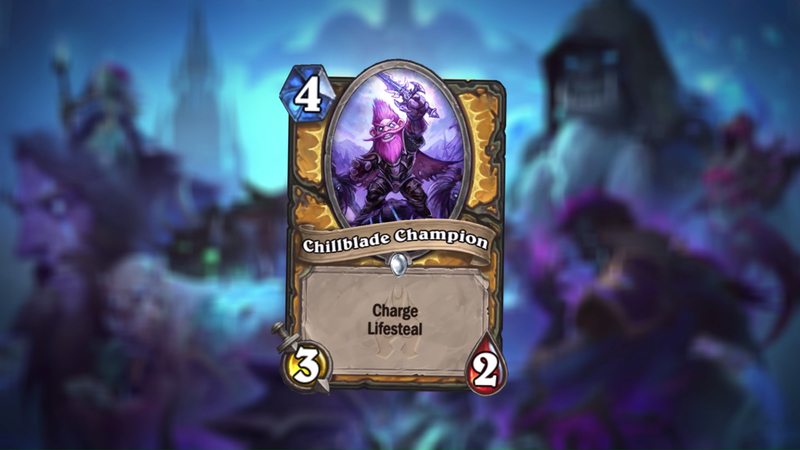 The Pirate Warrior, for example, is mostly neutralized with a minion like the 3/2 Chillblade Champion, which can trade into a Bloodsail Raider or Dread Corsair to not only remove the threat, but also gain health back. Priests become downright scary to aggro decks, thanks to the new Spirit Lash spell, which can potentially clear the board of small minions, while also healing for each one damaged. What's important about Lifesteal, however, is that while it helps bring control up to the level of aggro decks, it doesn't entirely neutralize the aggro game. If an opposing Shaman has five minions in play, a Bloodlust still likely ends the game. If a Pirate Warrior has sufficiently built up a Frothing Berserker, it's still going to hurt a lot. Hunters can still "Adapt" their beasts with Crackling Razormaw and get a step up. Lifesteal isn't the end of aggro decks, but its introduction means that there's just as much reason to play a control deck as there is to play an aggressive one. Things are more balanced, which is exactly what the goal should be. There won't be any new card reveals until July 24, so there is a chance that Blizzard could go overboard with the Lifesteal mechanic. But on paper, it does address the aggro problem. There will still be instances of games ending around Turns 4 or 5, but they should be far less frequent. That promises to make games more interesting and cerebral, especially as Hearthstone players wait to see how the aggro meta responds. So they figured out lifelink from mtg was a good idea (valiantly trying to "make creatures matter", again same as mtg).